San Lorenzo al Mare is a comune (municipality) in the Province of Imperia in the Italian region Liguria, located about 100 kilometres southwest of Genoa and about 10 km (6 mi) west of Imperia. As of 31 December 2004, it had a population of 1,409 and an area of 1.3 square kilometres (0.5 sq mi). Giacomo Nizzolo is an Italian racing cyclist, who currently rides for UCI WorldTeam Team Dimension Data. Giovanni Visconti is an Italian professional road racing cyclist, who currently rides for UCI Professional Continental team Neri Sottoli–Selle Italia–KTM. UnitedHealthcare Pro Cycling Team was a professional road bicycle racing team, run by Momentum Sports Group and based in the United States. The team is sponsored principally by UnitedHealth Group. It began at the end of 2009 as a reorganization of the OUCH Pro Cycling Team, with headlining cyclist Floyd Landis leaving the team. The team folded at the end of the 2018 season, with the main sponsor transferring to Rally Cycling. Colombia are a Colombian UCI Professional Continental cycling team based in Adro (Italy) that participates in UCI Continental Circuits and UCI World Tour races. George Bennett is a New Zealand professional road racing cyclist, who currently rides for UCI WorldTeam Team Jumbo–Visma. He represented New Zealand at the 2016 Summer Olympics. Steven Kruijswijk is a Dutch road bicycle racer, who currently rides for UCI WorldTeam Team Jumbo–Visma. Kruijswijk is best known for his strong ability in the mountains where he has taken his greatest success. He has finished in the top 5 in all three Grand Tours, and was very close to win the Giro d'Italia in 2016 but ruined his chances when he crashed into a snow bank on the penultimate mountain stage. 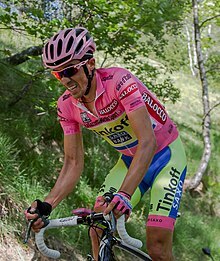 The 2011 Giro d'Italia was the 94th Giro d'Italia, one of cycling's Grand Tours. The race started on 7 May with a team time trial in Turin to celebrate the 150th anniversary of Italian unification, when the city served as the first capital of the single state. Stage 12 of the 2012 Vuelta a España was contested on 30 August, and the race concluded with Stage 21 on 9 September. The second half of the race was situated entirely within Spain; starting with a medium mountain stage from Vilagarcía de Arousa to the Mirador de Ézaro in Dumbría, before four summit finishes and, ultimately, the customary race-concluding ride into Madrid. The 2013 Tour of the Basque Country was the 53rd running of the Tour of the Basque Country cycling stage race. It started on 1 April in Elgoibar and ended on 6 April in Beasain, and consisted of six stages, including a race-concluding individual time trial. It was the ninth race of the 2013 UCI World Tour season. The 2015 Tirreno–Adriatico was the 50th edition of the Tirreno–Adriatico stage race. It took place from 11 to 17 March and was the third race of the 2015 UCI World Tour. The race is one of the most important races in the early part of the cycling season and is used by riders preparing both for the Grand Tours and for the classics season. The 2015 Vuelta a España was a three-week Grand Tour cycling race. The race was the 70th edition of the Vuelta a España and took place principally in Spain, although two stages took place partly or wholly in Andorra, and was the 22nd race in the 2015 UCI World Tour. The 3,358.1-kilometre (2,086.6 mi) race included 21 stages, beginning in Marbella on 22 August 2015 and finishing in Madrid on 13 September. It was won by Fabio Aru, with Joaquim Rodríguez second and Rafał Majka (Tinkoff–Saxo) third. The 2016 Giro d'Italia was the 99th edition of the Giro d'Italia, one of cycling's Grand Tour races. The Giro started in Apeldoorn on 6 May with a 9.8 km (6 mi) individual time trial, followed by two other stages in the Netherlands, both between Nijmegen and Arnhem. After a rest day, there were 18 further stages to reach the finish on 29 May. These stages were principally in Italy, although two stages partly took place in France. The 2016 Paris–Nice was a road cycling stage race that took place in France between 6 and 13 March 2016. It was the 74th edition of the Paris–Nice and was the second event of the 2016 UCI World Tour. The 2016 Tour of the Basque Country was a road cycling stage race that took place in the Basque Country between 4 and 9 April 2016. It was the 56th edition of the Tour of the Basque Country and the ninth event of the 2016 UCI World Tour. The 2016 Volta a Catalunya was a road cycling stage race that took place in Catalonia, Spain, from 21 to 27 March. It was the fifth race of the 2016 UCI World Tour and the 96th edition of the Volta a Catalunya. 1 2 3 4 Farrand, Stephen (19 January 2015). "2015 Giro d'Italia teams announced". Cyclingnews.com . Immediate Media Company. Archived from the original on 10 April 2015. Retrieved 13 October 2015. 1 2 Brown, Gregor (19 January 2015). "Giro announces five wildcard teams; four Italian squads included". VeloNews . Competitor Group, Inc. Retrieved 13 October 2015. ↑ Brown, Gregor (19 January 2015). "Giro d'Italia 2015 wildcards announced: CCC in, Colombia out". Cycling Weekly . Time Inc. UK . Retrieved 13 October 2015. ↑ Brown, Gregor (20 January 2015). "Giro d'Italia wildcards CCC Sprandi could leave ex-dopers at home". Cycling Weekly . Time Inc. UK . Retrieved 13 October 2015. ↑ "Gallery: Official team presentation for the 2015 Giro d'Italia". Cyclingnews.com . Immediate Media Company. 8 May 2015. Archived from the original on 10 May 2015. Retrieved 13 October 2015. 1 2 "Giro d'Italia 2015 - General Classification". ProCyclingStats. ProCyclingStats BV. Retrieved 13 October 2015. ↑ Powlison, Spencer (8 May 2015). "Bennett out of Giro due to low cortisol levels". VeloNews . Competitor Group, Inc. Retrieved 13 October 2015. ↑ "Giro d'Italia 2015 - General Classification". ProCyclingStats. ProCyclingStats BV. Retrieved 13 October 2015. 1 2 Brown, Gregor (7 May 2015). "Race organiser defends Giro d'Italia start-list". Cycling Weekly . Time Inc. UK . Retrieved 13 October 2015. 1 2 3 4 Benson, Daniel (30 April 2015). "2015 Giro d'Italia preview". Cyclingnews.com . Immediate Media Company. Archived from the original on 10 September 2015. Retrieved 13 October 2015. 1 2 3 4 5 Puddicombe, Stephen (6 May 2015). "Giro d'Italia 2015: Who will win?". Cycling Weekly . Time Inc. UK . Retrieved 13 October 2015. 1 2 3 4 5 "Giro d'Italia: iscritti Aru, Contador, Porte, Uran e Van den Broeck". La Gazzetta dello Sport (in Italian). RCS Sport. 29 April 2015. Retrieved 13 October 2015. ↑ Hood, Andrew (2 July 2015). "The double: Behind Contador's audacious ambition". VeloNews . Competitor Group, Inc. Retrieved 13 October 2015. ↑ Conde, Mikkel (9 May 2015). "2015 Giro d'Italia preview". Cyclingtips.com.au. Wallace Media Pty Ltd. Retrieved 13 October 2015. ↑ Fretz, Caley. "Giro d'Italia 2015 preview". VeloNews . Competitor Group, Inc. Retrieved 13 October 2015. ↑ Farrand, Stephen (29 July 2015). "2015 Giro d'Italia to start with a team time trial in Sanremo". Cyclingnews.com . Immediate Media Company. Archived from the original on 6 May 2015. Retrieved 13 October 2015. ↑ Brown, Gregor (15 September 2015). "Giro d'Italia to climb Madonna di Campiglio in 2015". Cycling Weekly . Time Inc. UK . Retrieved 13 October 2015. ↑ Wynn, Nigel (6 October 2014). "Giro d'Italia 2015 route presentation gallery". Cycling Weekly . Time Inc. UK . Retrieved 13 October 2015. 1 2 3 4 5 6 7 Farrand, Stephen (6 October 2015). "Giro d'Italia 2015 route unveiled". Cyclingnews.com . Immediate Media Company. Archived from the original on 16 April 2015. Retrieved 13 October 2015. ↑ "Giro d'Italia 2015 stage 3 preview". Cycling Weekly . Time Inc. UK. 11 May 2015. Retrieved 13 October 2015. ↑ "Giro d'Italia 2015 stage 5 preview". Cycling Weekly . Time Inc. UK. 12 May 2015. Retrieved 13 October 2015. 1 2 3 4 Brown, Gregor (6 October 2014). "Giro d'Italia 2015 route features six high mountain finishes". Cycling Weekly . Time Inc. UK. Archived from the original on 18 June 2015. Retrieved 13 October 2015. ↑ "Giro d'Italia 2015 stage 7 preview". Cycling Weekly . Time Inc. UK. 14 May 2015. Retrieved 13 October 2015. ↑ "Giro d'Italia 2015: Stage 14 preview". Cyclingnews.com . Immediate Media Company. 6 May 2015. Archived from the original on 10 May 2015. Retrieved 13 October 2015. ↑ "Giro d'Italia 2015 stage 15 preview". Cycling Weekly . Time Inc. UK. 23 May 2015. Retrieved 13 October 2015. ↑ "Giro d'Italia 2015 stage 16 preview". Cycling Weekly . Time Inc. UK. 24 May 2015. Retrieved 13 October 2015. ↑ "Giro d'Italia 2015 stage 17 preview". Cycling Weekly . Time Inc. UK. 26 May 2015. Retrieved 13 October 2015. ↑ "Giro d'Italia 2015 stage 18 preview". Cycling Weekly . Time Inc. UK. 27 May 2015. Retrieved 13 October 2015. ↑ "Route: Giro d'Italia 2015 – Gazzetta dello Sport". Route: Giro d'Italia 2015 – Gazzetta dello Sport. ↑ "Giro d'Italia 2015". Cyclingnews.com. ↑ "Stage 08° - Giro d'Italia 2015 – Gazzetta dello Sport". Stage 08° - Giro d'Italia 2015 – Gazzetta dello Sport. ↑ Benson, Daniel (11 May 2015). "Giro d'Italia: Orica-GreenEdge win team time trial". Cyclingnews.com . Immediate Media Company. Archived from the original on 13 July 2015. Retrieved 15 October 2015. ↑ Cossins, Peter (11 May 2015). "Giro d'Italia: Viviani wins sprint in Genoa". Cyclingnews.com . Immediate Media Company. Archived from the original on 12 September 2015. Retrieved 15 October 2015. ↑ Windsor, Richard (11 May 2015). "Michael Matthews wins Giro d'Italia stage three". Cycling Weekly . Time Inc. UK . Retrieved 15 October 2015. ↑ Clarke, Stuart (11 May 2015). "Domenico Pozzovivo out of Giro d'Italia after nasty crash". Cycling Weekly . Time Inc. UK . Retrieved 15 October 2015. ↑ Benson, Daniel (13 May 2015). "Giro d'Italia: Formolo takes solo win on stage 4 in La Spezia". Cyclingnews.com . Immediate Media Company. Archived from the original on 10 September 2015. Retrieved 15 October 2015. ↑ Farrand, Stephen (13 May 2015). "Giro d'Italia: Contador climbs into maglia rosa on summit finish to Abetone". Cyclingnews.com . Immediate Media Company. Archived from the original on 10 September 2015. Retrieved 15 October 2015. ↑ Farrand, Stephen (14 May 2015). "Giro d'Italia: Greipel wins on stage 6". Cyclingnews.com . Immediate Media Company. Archived from the original on 12 September 2015. Retrieved 15 October 2015. ↑ Farrand, Stephen (16 May 2015). "Giro d'Italia: Ulissi wins in Fiuggi". Cyclingnews.com . Immediate Media Company. Archived from the original on 10 September 2015. Retrieved 15 October 2015. ↑ Cossins, Peter (15 May 2015). "Giro d'Italia: Intxausti wins stage 8 summit finish at Campitello Matese". Cyclingnews.com . Immediate Media Company. Archived from the original on 29 December 2014. Retrieved 15 October 2015. ↑ Elton-Waters, Jack (17 May 2015). "Paolo Tiralongo wins stage nine of the Giro d'Italia, as Contador stays in pink". Cycling Weekly . Time Inc. UK . Retrieved 15 October 2015. ↑ Benson, Daniel (20 May 2015). "Giro d'Italia: Boem takes breakaway sprint to win in Forlì". Cyclingnews.com . Immediate Media Company. Archived from the original on 7 September 2015. Retrieved 16 October 2015. ↑ Ryan, Barry (21 May 2015). "Giro d'Italia: Richie Porte docked two minutes". Cyclingnews.com . Immediate Media Company. Archived from the original on 26 July 2015. Retrieved 16 October 2015. ↑ "Zakarin solos to victory in Giro stage 11". VeloNews . Competitor Group, Inc. 20 May 2015. Retrieved 16 October 2015. ↑ Cossins, Peter (21 May 2015). "Giro d'Italia: Gilbert wins stage 12 in Vicenza". Cyclingnews.com . Immediate Media Company. Archived from the original on 14 September 2015. Retrieved 16 October 2015. ↑ "Giro d'Italia: Modolo wins bunch sprint in Jesolo". Cyclingnews.com . Immediate Media Company. 23 May 2015. Archived from the original on 9 September 2015. Retrieved 16 October 2015. ↑ Cossins, Peter (24 May 2015). "Giro d'Italia stage 14: Alberto Contador storms back into race lead". Cyclingnews.com . Immediate Media Company. Archived from the original on 10 September 2015. Retrieved 16 October 2015. ↑ Stokes, Shane (25 May 2015). "Giro d'Italia: Landa wins at Madonna di Campiglio, Contador gains seconds on Aru". Cyclingtips.com.au. Wallace Media Pty Ltd. Retrieved 16 October 2015. ↑ Brown, Gregor (25 May 2015). "Injured Richie Porte withdraws from Giro". VeloNews . Competitor Group, Inc. Retrieved 16 October 2015. ↑ Windsor, Richard (26 May 2015). "Mikel Landa takes second stage victory on gruelling day at Giro d'Italia". Cycling Weekly . Time Inc. UK . Retrieved 16 October 2015. ↑ "Giro d'Italia: Modolo wins stage 17 in Lugano". Cyclingnews.com . Immediate Media Company. 28 May 2015. Archived from the original on 18 September 2015. Retrieved 16 October 2015. 1 2 "Giro d'Italia: Gilbert wins stage 18 in Verbania". Cyclingnews.com . Immediate Media Company. 28 May 2015. Archived from the original on 14 September 2015. Retrieved 16 October 2015. ↑ Stokes, Shane (30 May 2015). "Aru fights back to nab stage 19 of Giro d'Italia, Contador keeps powder dry for final mountain stage". Cyclingtips.com.au. Wallace Media Pty Ltd. Retrieved 16 October 2015. 1 2 Wynn, Nigel (30 May 2015). "Alberto Contador under pressure in Giro d'Italia's penultimate stage as Aru wins again". Cycling Weekly . Time Inc. UK . Retrieved 16 October 2015. ↑ Ryan, Barry (30 May 2015). "Team orders temper Landa's aggression on the road to Sestriere". Cyclingnews.com . Immediate Media Company . Retrieved 16 October 2015. ↑ O'Shea, Sadhbh (1 June 2015). "Alberto Contador wins Giro d'Italia overall". Cyclingnews.com . Immediate Media Company. Archived from the original on 13 March 2015. Retrieved 16 October 2015. ↑ "Alberto Contador wins 2015 Giro d'Italia, Iljo Keisse takes final stage". Eurosport. 31 May 2015. Retrieved 25 October 2015. 1 2 3 4 5 Laura, Weislo (13 May 2008). "Giro d'Italia classifications demystified". Cyclingnews.com . Future plc . Retrieved 27 August 2009. 1 2 3 "Giro revamps time bonus and points systems for 2014 edition". VeloNews . Competitor Group, Inc. 8 April 2014. Retrieved 16 October 2015. ↑ "Giro 2015: Ritorna il Mortirolo, sarà decisivo il Colle delle Finestre" [Giro 2015: The Mortirolo returns; the Colle delle Finestre will be decisive]. La Gazzetta dello Sport (in Italian). RCS Sport . Retrieved 16 October 2015. 1 2 "Giro d'Italia 2015 - General Classification". ProCyclingStats. ProCyclingStats BV. Retrieved 16 October 2015. ↑ "Giro d'Italia 2015 - Mountains classification". ProCyclingStats. ProCyclingStats BV. Retrieved 16 October 2015. ↑ "Giro d'Italia 2015 - Points classification". ProCyclingStats. ProCyclingStats BV. Retrieved 16 October 2015. ↑ "Giro d'Italia 2015 - Youth Classification". ProCyclingStats. ProCyclingStats BV. Retrieved 16 October 2015. ↑ "Giro d'Italia 2015 - Teams Classification". ProCyclingStats. ProCyclingStats BV. Retrieved 16 October 2015. ↑ "Percorso tappa 21 - Giro d'Italia 2015". La Gazzetta dello Sport . RCS Sport . Retrieved 16 October 2015.
the regulations for the 2014 Giro, which were substantially the same: "Regolamento 97° Giro" (PDF). Giro d'Italia . RCS Sport . Retrieved 17 October 2015.
the results for the first stage, which indicate the points awarded: Cossins, Peter (11 May 2015). "Giro d'Italia: Viviani wins sprint in Genoa". Cyclingnews.com . Immediate Media Company. Archived from the original on 12 September 2015. Retrieved 15 October 2015. ↑ "Percoso tappa 21°". Giro d'Italia . RCS Sport . Retrieved 17 October 2015. Wikimedia Commons has media related to Giro d'Italia 2015 .